Keeps items neat, organised and tidy. Comes with 3-tiers of inner racks. 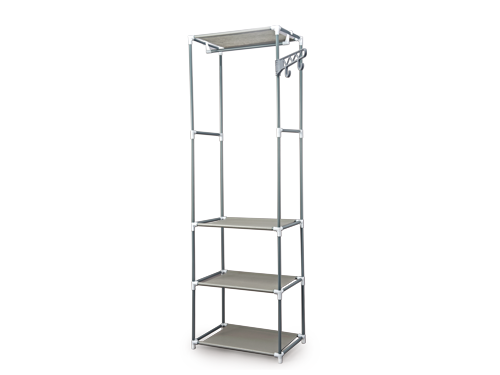 Each rack can load up to 15kg. Comes with extendable 360° swing hanger with 2 hooks. Swing hanger can withstand up to 1.68 kg and is stainless steel piping with ABS plastic joined to body of main rack. Size between tier 1 and tier 2: 55(L) x 35(W) x 104(H) cm. Size between tier 2 and tier 3: 55(L) x 35(W) x 34(H) cm. Overall size: 55(L) x 35(W) x 170(H) cm.